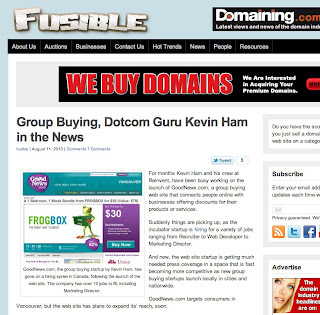 First Photo: Fusible's triple threat Google alerting keyword-rich, trend-filled headline: "Group Buying" "guru" "News" "Kevin Ham"
Sully & Fusible. Sounds like it should be a Vegas act or the name of a fish and tackle company. But Mike Sullivan and the anonymous soul behind Fusible are bloggers who stormed onto the scene in 2010 and again, in the spirit of marketing which is the benchmark for this year's recognition, both differentiated for competitive advantage in a crowded market. As a result BOTH blogs are on my MUST READ daily list because I will always get something in return for the time I take to visit there. Learn something new. Meet someone new. 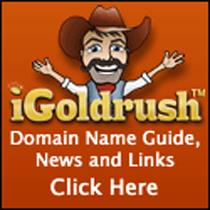 Most domain blogs just regurgitate the same old press releases. Most often the story can be gleamed from scanning the headline alone. That's why the FragerFactor has taken a different approach. And I may just be feeding my big ego here, but I have seen more than enough evidence that both Sully and Fusbile are students of my own blog and style, learning how to drive interest and traffic through headlines that stand out. Learning how to invoke bigger names that borrow and transfer equity to their own. Like me, they also use logos and graphics to demonstrate and explain the copy, communicating with impact. This step takes a lot of time that few bloggers are willing to invest. Sully's recent headline in quote marks "I have been part of selling over 6 million websites" is taken right from the Fragerized copy playbook. Both Sully and Fusible post early and often on a wide variety of topics. They know how to key the Google alerts on hot trend topics such as"Tweets" "Twitter" "Slots" Gambling" "Chatroulette" and "Group Buying." But more from a personal point of view I really appreciate the work they do and the depth beneath the headlines they go to bring the story forward with sound research and fact-based support. I don't know how Mike Sullivan gets connected to his subjects or finds time to interview them all, but he has given us a road map to success filled with actionable tips and techniques that can be applied to anyones advantage. Sully's broken many a story that no one else has covered. For example, "Monster's View of the Internet", his in-depth interview of Rob Monster— is what got my attention focused on Epik before it was a household word. His revelations about "Marriage.com" was the first of many stories to come that gave us a front-row seat to small business and the goals and ambitions of entrepreneurs starting up and how they about (which helps us learn how to sell to them) domain names. Fusible has opened a whole new world f domains within domains for me. 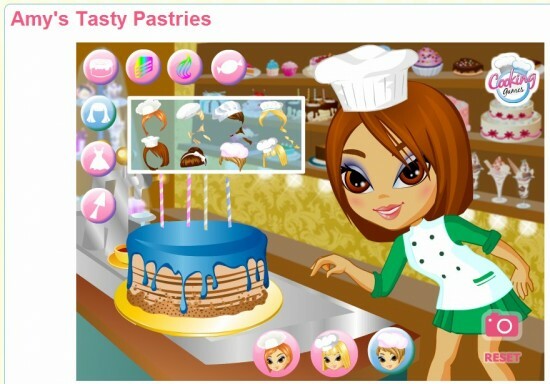 The purchase of cookinggames.com stumped seasoned pros like Larry Fisher, but not Fusible who broke the news, giving us a tour of that world filled with eye-opening facts and statistics— a story that continues as a work in progress to this day. In fact, it's reason why Bill Kara, founder of Hallpass Media (a frequent cover of Fusible) has also earned honors in our domaining's 20 most fascinating people for 2010 series and will be profiled later this week. Both Fusible and Sully's Blog are strong on the social media side and use that marketing strategy to drive brand awareness up. It's the brands they've built that make them worthy to be among domainings most fascinating people this year. 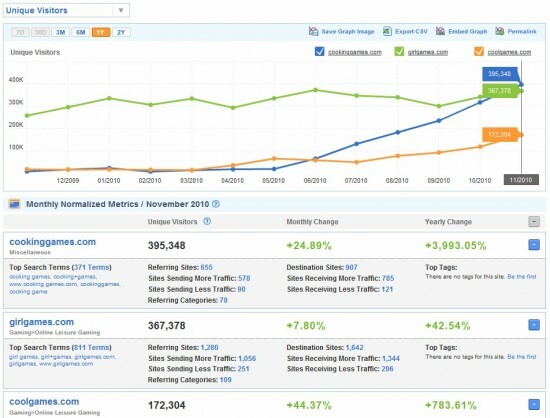 Think of how many new blogs were launched this year. How many do you remember without having to use Domaining.com (another of this year's honor recipients) to find them? Sully's Blog and Fusible are exceptions to that rule. 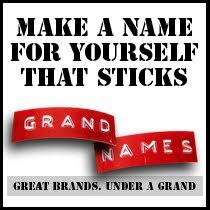 They are brands that you know and trust and that stand for something bigger than just the same old domain name news as ususal.